Have fun in the kitchen with this great children's bakeware set featuring 14 brightly coloured cooking tools and accessories. Perfect for young chefs who want to join in with baking cakes, mixing ingredients and shaping cookies. 27 x Alphabet Baking Set. Includes Multi Coloured Alphabet Cutters. Set contains: 26 cutters a b c d e f g h i j k l m n o p q r st u v x y z and 1 baking tray. Perfect for cookies, biscuits, etc. Lekue Swiss Roll, Roulade, Yule Log Kit. This Swiss Roll Kit by Lékué makes it easy for you to create perfect Swiss Roll, sweet or savoury Roulades and Yule Logs. Inspired by the Swiss Rolls on Great British Bake Off?. Mini Tortilla Baker set of 4. Bake crispy tortilla bowls without grease in minutes. Make crispy low-fat tortilla bowls without frying! Perfect for creating molded desserts and salads. Ideal for baking bread to serve your favorite bread dip. Dunelm adjustable silicone pie crust protector. Adjustable from 10cm to 25cm and prevents the outer edge of the pie burning. Easy to clean, non stick and can be used on fresh or frozen pies. Brand new. Any questions just ask. Please check out my other items, more being added over the next few days. Payment within 3 days of auction end, unless contacted. Thank you. This nine-piece Non Stick Baking and Cook Oven Bakeware Set,will ensure you're equipped for everything from baking cupcakes to roasting potatoes. Easy to clean and finished with a non-stick coating, this set includes two roasters, a loaf tin, two sandwich tins, a pizza tray, a four-cup Yorkshire pudding tray, a small bun tray, and a large oven tray. Mix together the chocolate sponge mix, fill the 6 large silicone moulds a quarter full, bake for 5 minutes, add the frozen fillings and the rest of the sponge mix and bake until crispy on top. 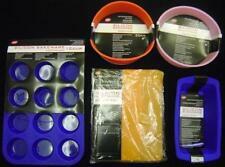 6 individual silicone pudding moulds and a silicone tray to make up to 12 fondant centres and recipes. Children's Bakeware set featuring 14 brightly colored cooking tools and accessories. Contents: A cake shaped Silicone mould. 4 x cookie cutters. Colour selected at random. A 6 cup silicone tart tray. KITCHEN CORNER FUN SILICONE CAKE MOULDS x 2. COLOURS RANDOMLY SENT 'FLOWERS' or 'FISH'. Material: SILICONE - Wash before 1st Use! USE THEM FOR CAKES, JELLIES AND ICE CREAMS. ONE OF EACH PER SET. Included in the set is a pink silicone heart cake mould, 6 x red silicone heart cases and a pink/red heart silicone spatula. All you need is the right ingredients to create your delicious treat. The silicone mould and cases are non-stick making it easy for you to remove the cakes without breaking them up. 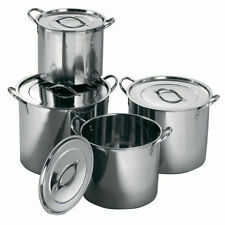 Cook variety of foods Robust Mirror Finish Handles Dishwasher safe Dimensions (W x D x H): 20 x 22 x 35cm . Add cute to your baking skills with the wonderful cupcake baking set. Included in the set is a hot pink silicone cupcake mould, hot pink silicone cupcake trivet and yellow with cupcake detail silicone spatula. Thermal shock resistant Easy to clean Microwave safe Scratch resistant Dimensions (W x D x H): 31 x 22 x 7cm . Children's bakeware set featuring 14 brightly coloured cooking tools and accessories Contents. Bakeware is ideal for bread, loaf, pate and cakes making. Nonstick, easy to use and clean. 1 Bread Box With Lid. Material:Iron. There are 3 vent holes at the bottom, which can enhance the demoulding effect and make it easier to demoulding. 1 Non-stick Baking Tray. This is a silicone mat for making macarons in uniform shapes and sizes. Material: Silicone. Non-stick design makes it easy to clean. Note: The real color of the item may be slightly different from the pictures shown on website caused by many factors such as brightness of your monitor and light brightness. 1 Grid Basket. Can be directly put on the oven shelf. Just wipe clean, wash in warm soapy water or put in the dish washer. Material: PTFE Coating Fiberglass Fabric. MisterChef Silicone Cake Pan for baking cake and quick bread recipes, like cornbread, with quick food release and easier cleanup. MisterChef Silicone Cake Pans are easy to use. Never cut in the baking pan. MisterChef Silicone Cake Pan for baking cake and quick bread recipes, like cornbread, with quick food release and easier cleanup. MisterChef Silicone Cake Pans are easy to use. This mould makes 15 cakes at once. Bakeware is ideal for bread, loaf, pate and cakes making. 1 Bread Box With Lid. Material:Iron. Nonstick, easy to use and clean. There are 3 vent holes at the bottom, which can enhance the demoulding effect and make it easier to demoulding.